Goomba's Greedy Gala is a casino board hosted by Goomba in Mario Party 4. He built it because he loves gambling, and a casino is the perfect place for his friends to have fun in. Here, Goombas are everywhere, and are put in charge of the games and shops (the one hosting wears a pink top hat, bow tie and cape). The main attractions here are the large roulette wheel, and the dice areas. 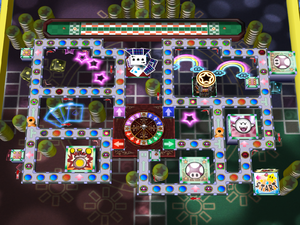 The roulette wheel is in the center of the board, dividing it into four sections that the players access by playing the roulette. Every time players come to it, the Goomba in charge makes the wheel spin, then throws a marble on it. Wherever the marble lands on is the area the player is taken to. To make it easier, the Goomba asks the player if they want to pay him coins to make them "have a better chance" at getting to the area they want to go. The more coins paid, the better the chances. If the marble lands on a star area, the player wins 20 coins, and they are allowed to go to any area they wanted. In the areas, there are a few ways to get out. One way is getting to the dice spots. Here, a Goomba appears to challenge the player to a dice game, where the highest number wins. If the player rolls higher, they win 10 coins. If the player rolls lower or the same number as the Goomba, they are sent back to start. The player automatically loses if Goomba rolls a "10" (as they cannot roll any higher), in which case the Goomba sends them back to the start. Another way is landing on a Happening Space at the top of the board. This makes players make their way to the other side of the board by means of riding on a poker chip across a craps table. A Goomba slams into them, and they have to control the movement to get the coins on their way to the other side. Mario playing the slot machine to gain Coins. The Item Minigame of the board involves three Goombas on a playing card. Once they showed what items they have, they shuffle around like a shell game. When they stop, the player has to pick a Goomba. The Goomba picked gives the player his item. The Coin Minigame involves a slot machine. Players do ground pounds to stop each slot. The coin amounts shown in a row is the amount of coins they win. If the slots don't match, they get one coin. In Story Mode, if the player beats their opponents on the board, Goomba challenges them to a Minigame called Goomba's Chip Flip in order to win his present.